Fort Recovery Beachfront Villa Hotel & Resort, located on the Caribbean side of Tortola, the British Virgin Islands, is one of the most exclusive beachfront properties. Chosen 'Best Resort' in the BVI by the readers of Captain's Guide Magazine, Fort Recovery was awarded the 'Golden Compass Award 2007'. The original twelve Villas had been upgraded and completely renovated, with 30 Villas total. All have full kitchen facilities. The fourteen 1-3 bedroom newer Beachfront Villas are beautifully designed and all the amenities that goes with a very spacious living accommodation. All the villas are steps away from the small, private sandy beach with excellent swimming, snorkeling and shelling. The Panoramic views are enjoyed by all and are truly a Photographer's dream. A/C, Cable TV, Free WI-FI internet, Daily housekeeping service, Full Kitchen or Kitchenette, Living room, bedroom, bath and balcony or patio are included. Restaurant, Spa Services, Yoga and Boat sightseeing tours and snorkel trips are available on the premises. Fort Recovery is a historic landmark with the oldest standing Fort in the Caribbean. Be sure to check out our exclusive coverage by Discovery's Travel Channel. Fort Recovery was the only resort on Tortola chosen by Travel Channel for their BVI Showcase. Beachfront Superior Stes. Kitchenette, A/C, WI-FI, Private Porches or Balcony. 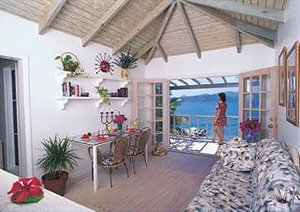 These spacious beachfront superior suites consist of a kitchenette with microwave, refrigerator, toaster and blender, large master bedroom, bathroom and oversized living room with French doors that open to spectacular views of the Caribbean from either a private porch or your own private balcony. With tastefully decorated interiors all superior suites have A/C, Cable TV, WI-FI Internet access and ceiling fans. Beachfront suite, fully equipped kitchen, A/C, WI-FI, Private garden patio or balcony These unique beachfront cottage-style suites consist of a fully equipped kitchen, living room, large master bedroom and bathroom. Living room opens to spectacular views of the Caribbean from either a private garden patio or your own private balcony. With tastefully decorated interiors all suites have A/C, Cable TV, WI-FI Internet access and ceiling fans. Beachfront 2 Bdrm suite. 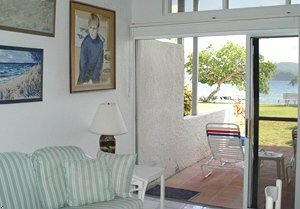 Full Kitchen, A/C, WI-FI, Private Patio or Balcony Very charming seaside villas with superb views. All rooms are uniquely decorated with spacious living rooms, kitchen, two large bedrooms each with own bathroom, one large lounging patio, private master bedroom patio and tropical surrounding gardens. All Villas and Penthouses have free W-FI internet access, daily housekeeping, toiletries, cable TV, digital A/C, fully equipped kitchens or kitchenette, ceiling fans and welcome bouquet of tropical flowers. Beachfront 3 Bdrm Suite. Full Kitchen. A/C, WI-FI, Private Porch or Balcony. Luxurious Three Bedroom Villa style rooms with our private white sandy beach at your feet. Each room has its own unique flair and style, three bathrooms, fully equipped kitchens, Digital A/C, Cable TV, Free WI-FI internet Access, ceiling fans, huge living room, private patios and gardens. All Suites and Penthouses have free W-FI internet access, daily housekeeping, toiletries, cable TV, digital A/C, fully equipped kitchens or kitchenette, ceiling fans and welcome bouquet of tropical flowers. Luxury Beach Villa Sleeps 16 A/C, WI-FI, Full Kit., Wraparound Porch, spectacular view Originally our elegant Four bedroom beach house, the Beach House was newly constructed and reaching completion the end of this December, 2007. This large, Beachfront tropical home is beautifully appointed in your own secluded niche of the villa style resort. You will find the beach a step off your outdoor living room and dining room porch, and the 16th century historic fort to your side. It consists of an Art Gallery entrance way, an oversized living room with adult and children's library, fully equipped kitchen, dining area that seats 20+ family and friends, three spectacular beachfront master bedrooms & master baths directly facing the beach and five additional queen size bedrooms all with personal bath. 1 Bdrm Superior Beachfront Corner Suite Kitchenette, Private Patio or Balcony. These spacious, superior corner suites consist of a kitchenette with microwave, refrigerator, toaster andor blender, large master bedroom, bathroom and living room with French doors which opens up to spectacular views of the Caribbean from either a private garden patio or your own private balcony. With tastefully decorated interiors all villas have A/C, Cable TV, WI-FI Internet access and ceiling fans. 1 Bdrm Standard corner suite. Full kitchen A/C, WI-FI, private patio or balcony These unique cottage-style corner suites consist of a fully equipped kitchen, living room, large master bedroom and bathroom. Living room doors open to spectacular views of the Caribbean from either a private garden patio or your own private balcony. With tastefully decorated interiors all villas have A/C, Cable TV, WI-FI Internet access and ceiling fans. The ambiance of the Fort Recovery Seaview Resturant is lovely with a gorgeous view of the ocean. Featuring one of the best gourmet menus on the island, the cuisine ranges from meat, seafood, vegetarian food and Caribbean specialties. Each price-fixed dinner includes soup, bread, main entree and dessert. A full American Breakfast is also served from 7am until 11 am. A complimentary Continental Breakfast consisting of coffee, tea, and a pastry is also offered. Guests may sit outside on the deck with a cooling breeze with the sounds of wildlife emanating from the surrounding lush gardens or in the air conditioned inside room featuring a unique assortment of artifacts, fine dining tables, intimate lighting and high quality decor. 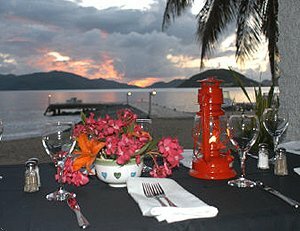 The Restaurant, private to the Resort, can accommodate large parties and caters to Wedding Receptions, Wedding Rehearsal Dinners, Family Reunions, Birthday Parties, Cocktail Parties or any other special occasion our guests may request. The restaurant is open 6 days a week. With a 24 hour notice, guests may also have the option of being served by waiter in the privacy of their villas. Caves,Duty-Free Shopping,Eco-tourism & whale-watching,Fishing and surfing, Hiking and Mountain climbing,Horseback riding,Rain Forest,Award-winning Restaurants,Swimming with the Dolphins, Convenient ferry access to Virgin Gorda, Jost Van Dyke, Peter Island, Marina Cay, St.Thomas, and St.John. With each seven nights stay, Fort Recovery guests receive a half-day snorkeling trip. You can also arrange with our on-site captain for extra trips. Our fabulous dock with two promenades, a large space for sun bathing, is an ideal spot to jump into the water as well as the fresh water swimming pool. There are also many dive shops, sailing day-charters, sport fishing boats, windsurfing, kayaks, and swimming with the Dolphins on the island.